They have seen and experienced trauma no one – human or nonhuman – should endure. 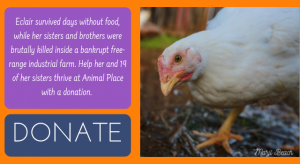 The “free-range” farm – with 36,000 chickens – where they were being raised went bankrupt. The farmer allowed activists the opportunity to save as many lives as possible. While compassionate volunteers gently caught birds, workers at the other end of the enormous shed were killing birds in a gruesome manner – trying to break each bird’s neck and then decapitating them. As their sisters and brothers screamed in fear and pain before their grisly deaths, hundreds of other birds would soon experience the warmth of straw, the kindness of humans, and a chance at life. By the end of the rescue, more than 600 lives were saved and transported to Luvin Arms Sanctuary in Colorado. Through networking, Animal Place found homes for nearly 100 of the chickens at sanctuaries and private homes in California and Oregon. More than 40 came to our sanctuary before going off to their homes, while twenty are staying as permanent residents. Despite their size, these are babies. They cheep and peep like the 8-week-old “kids” they are. Had the farm not gone bankrupt, not allowed activists in to save these birds, their fate at 5-6-weeks-old was the slaughterhouse. All of these peepers are now ambassadors, living reminders of who is harmed by animal agriculture. They will change lives with their outgoing personalities, love of purring, enjoyment of sitting on laps and pecking at freckles. And you can change their lives with a donation toward their care. We constructed a new small barn to accommodate the sudden increase in our peeper population. We must house them separately due to their dietary restrictions and strong opinions on food.